Buddhist Compassion Relief Tzu Chi Foundation has been delivering charity promises in the Sichuan Province, China, ever since the devastating earthquake on May 12, 2008. As soon as the disaster struck, the foundation mobilized volunteers from different areas to prepared more than 940,000 free hot meals and delivered packs of daily necessities to comfort survivors in De-Yang City. Apart from short term relief, Tzu Chi Foundation also launched a long-term compassion relief projects such as re-building five schools, a cultural square, and 91 villagers' permanent housing in De-Yang City. 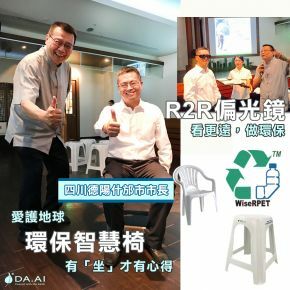 In addition, Shi-Fang DA.AI Technology Co., Ltd. and Luo-Shui Environmental Protection Center was also established around the same time to better provide residents with opportunities to do recycling in their hometown. Shi-Fang DA.AI has also become a demonstration point and environmental education center for the community, where nearly 50,000 visitors showed up since establishment. 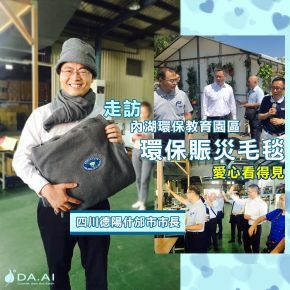 A decade has passed, Wang Duan-Zheng, the Deputy CEO of Tzu Chi Foundation, accompanied Mr. Qing Wei, Mayor of Shi-Fang Town of De-Yang City, and his delegation to visit Tzu Chi Nei-Hu environmental protection center on June 12th. 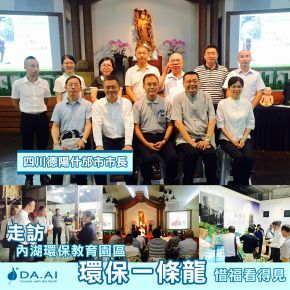 Representatives from Tzu Chi environmental protection mission and Taiwan DA.AI Technology also participated to share its compassionate R&D invention and implementation. Dr. Lori Chen shared DA.AI’s invention and the reason behind was based on the needs of disaster relief or out of caring for social events. Lori Chen later invited the participants to try out DA.AI Compassion Technology, pressure fabric, solar series, and R2R product series. Mayor Qing Wei praised, “Tzu-Chi really does a good job on environmental protection and eco invention.” Dr. Lori Chen concluded the presentation with Dharma Master Cheng Yen’s teaching that "smart people develop; while wise ones recycle.” This motto has been DA.AI’s spiritual guide behind these love and caring inventions; it’s not for profit but for environmental sustainability.